La Casa Adela is located on a hill overlooking the mountain valley of San Miguel de Allende . It is an impressive place , very special, exclusive and available for the realization of your wedding . 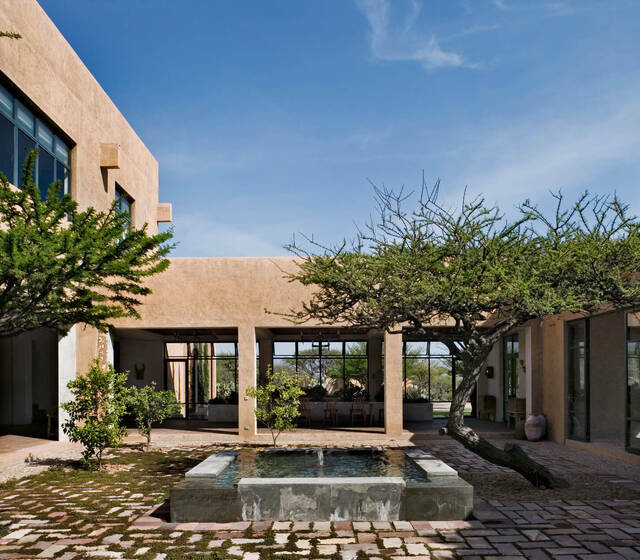 It was designed by award-winning architect David Howell , retains a contemporary style, has a stone deck, a wooden area, two terraces, an interior courtyard with citrus orchard and an impressive main room with windows that give you a beautiful view towards the mountains and the valley. The farm appeared in the hit movie "A Father, Not So Father" and in the magazine Interior Design. This hacienda is perfect to celebrate your wedding or any other special event with up to 150 guests. Its spaces are ideal for ceremonies and intimate receptions, both outdoors and indoors . In addition, they have furniture made by John Houshmand . In Casa Adela , in addition to the rent of the place, you can count on a wide catalog of optimal services to organize your celebration as you have always dreamed. Among them: banquet, ceremony, photography, music, transport, decoration, among other alternatives . Make your contact, inform yourself and schedule your visit, you will not be able to resist choosing it as a stage to celebrate your great day . Si deseas celebrar tu boda en San Miguel de Allende, no dudes en visitar Casa Adela, una hacienda con la que, sin dudas, jamás te olvidarás de tu momento y quedará por siempre grabado en tu memoria. Casa Adela is the perfect venue for your wedding/reception! The villa itself is so beautiful as are the expansive grounds — the views are breathtaking. It was a gorgeous evening and our table setup for dinner was perfect outside by the pool with the glow of flickering lanterns and beautiful flowers everywhere — so romantic and intimate! Casa Adela was extremely helpful in arranging everything for our special day. I highly recommend! Our wedding here was amazing! Gorgeous location fantastic staff. I would absolutely reccomend Adela House! My wife is from Mexico City and we were looking forward to arranging a small, romantic countryside wedding. We looked at several places, but settled on San Miguel for its culture and beauty. When we visited Casa Adela, we knew this was the place. The views of the mountains and the sunsets were the perfect backdrop to our cherished wedding photos. Our party of 75 had a truly special time. Este fue el lugar ideal para nuestra boda pequeña, por su cultura y belleza, todo fue realmente especial. Nuestra boda fue maravillosa, Las vistas del valle hicieron que nuestro día fuera más especial, y el patio era perfecto para nuestra cena, quedamos muy felices.